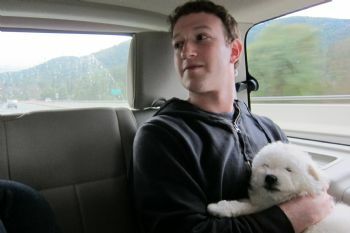 Facebook CEO Mark Zuckerberg and his longtime girlfriend, Priscilla Chan, adopted a puppy named Beast and have given him a Facebook fan page. So far, almost 25,000 people "like" Beast and follow the Puli's every fuzzy, adorable move. Beast also seems to have Zuckerberg wrapped around his finger, because he bragged in one status update that he "took a dump and made Mark Zuckerberg pick it up."